South Holland (Dutch: Zuid-Holland [ˌzœyt ˈɦɔlɑnt] ( listen)) is a province of the Netherlands with a population of just over 3.6 million as of 2015 and a population density of about 1,300/km2 (3,400/sq mi), making it the country's most populous province and one of the world's most densely populated areas. Situated on the North Sea in the west of the Netherlands, South Holland covers an area of 3,403 km2 (1,314 sq mi), of which 585 km2 (226 sq mi) is water. It borders North Holland to the north, Utrecht and Gelderland to the east, and North Brabant and Zeeland to the south. The provincial capital is The Hague, while its largest city is Rotterdam. Archaeological discoveries in Hardinxveld-Giessendam indicate that the area of South Holland has been inhabited since at least ca. 7,500 years before present, probably by nomadic hunter-gatherers. Agriculture and permanent settlements probably originated around 2,000 years later, based on excavations near Vlaardingen. In the classical antiquity, South Holland was part of the Roman Province of Germania Inferior, and the border of the Roman Empire ran along the Old Rhine and reached the North Sea near Katwijk. The Romans built fortresses along the border, such as Praetorium Agrippinae near modern-day Valkenburg, Matilo near modern-day Leiden, and Albaniana near modern-day Alphen aan den Rijn. A city was founded near modern-day Voorburg, Forum Hadriani. It was built according to the grid plan, and facilitated a square, a court, a bathhouse and several temples. After the departure of the Romans, the area belonged to the Frisian Kingdom, after which it was conquered by the Frankish king Dagobert I in 636. In 690, the Anglo-Saxon monk Willibrord arrived near Katwijk and was granted permission to spread Roman Catholicism by the Frankish king Pepin II. He accordingly founded a church in Oegstgeest, after which the entire area was gradually Christianised. The area was appointed to East Francia in the Treaty of Verdun in 843, after which the king granted lands to Gerolf, who had helped him claim the lands. This was the birth of the County of Holland. Gerolf was later succeeded by Dirk I, who continued to rule Holland under the Frankish king. In 1248, count William II ordered the construction of the Ridderzaal, which was later finished by his son and successor Floris V.
The first city in South Holland to receive city rights was Dordrecht, which did so in 1220. 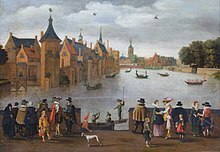 The city retained a dominant position in the area until it was struck by a series of floods in the late 14th century. The same century also saw a series of civil wars, the Hook and Cod wars, concerning the succession of count William IV. Both his daughter Jacqueline and his brother John, the latter supported by Philip the Good, Duke of Burgundy, claimed the throne. The conflict ended in 1490, with John victorious. Overall, the area of South Holland remained largely agrarian throughout the late Middle Ages. This changed around 1500, when Holland became Europe's most urbanised area. 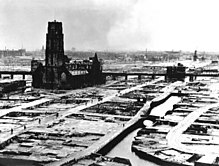 During the Eighty Years' War, the area of South Holland was the scene of the Capture of Brielle, the Siege of Leiden and the assassination of William the Silent. After the defeat of the French in 1813, this organisation remained unchanged for a year or so. When the 1814 Constitution was introduced, most borders were restored to their situation before the French period. The north and south of Holland were reunited as the province of Holland. However, the division hadn't completely been undone. Since its re-establishment in 1814, Holland had always had two King's Commissioners, one for the north and one for the south. Even though the province had been reunited, the two areas were still treated differently in some ways and the idea of dividing Holland remained alive. 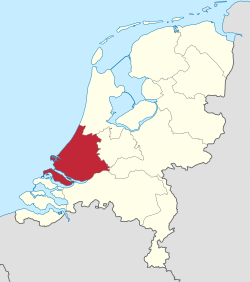 In 1840, it was decided to once again split Holland into North and South Holland, because the province of Holland was deemed too dominant in area, population and wealth. In the late 20th and early 21st centuries, five municipalities were transferred from South Holland to Utrecht; Oudewater in 1970, Woerden in 1989, Vianen in 2002, Leerdam and Zederik in 2019. Like the rest of the Netherlands, South Holland experiences a temperate oceanic climate, a Cfb-class according to the Köppen climate classification. The climate is influenced by the North Sea and the Atlantic Ocean, which results in relatively cooler summers and milder winters. Rain showers are common in the fall and winter seasons. Because of the flat surface, wind storms are also not uncommon in the winter. Although rain occurs all year long, the first six months of the year are relatively dry. Eastern winds can result in a temporary continental climate with relatively warm and dry summers and cold and stormy winters. The temperature varies between the 2 °C and 6 °C in the winter and 17 °C and 20 °C in the summer. 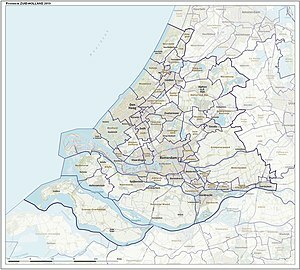 South Holland is divided into 52 municipalities. 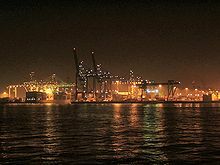 As of 2011, South Holland's gross regional product amounted €123.1 billion, or €34,883 per capita. This contributes to the gross domestic product of the Netherlands for 20.9%. South Holland's labour force amounts 1,661,000 people; 47.1% of the total population. The unemployment rate is 6.1%. ^ "CBS StatLine - Regional key figures; national accounts". statline.cbs.nl. ^ "Bevolking; kerncijfers" (in Dutch). CBS. Retrieved 24 March 2014. ^ "Category:Delftse Hout - Wikimedia Commons". commons.wikimedia.org. ^ "Regio's in economisch perspectief 2013" (PDF) (in Dutch). 30 November 2012. Retrieved 15 April 2014. ^ "'Leegstand van kassen in Westland dreigt'" (in Dutch). Nu.nl. 22 October 2012. Retrieved 29 April 2014. ^ "De Kracht van het Westland" (PDF) (in Dutch). 2008. Archived from the original (PDF) on 2014-04-29. Retrieved 29 April 2014. ^ "GLASTUINBOUW" (in Dutch). Westland.nl. 22 October 2012. Retrieved 29 April 2014. Wikimedia Commons has media related to South Holland. This page was last edited on 12 April 2019, at 08:50 (UTC).